Aufnahmen vom 23.11.1956 im Quintett mit Hank Mobley (tsax), Kenny Drew (p), dem leider früh verstorbenen Zwillingsbruder Addison Farmer (db) und Elvin Jones (dr). Damals konzentrierte sich Art Farmer noch nicht auf das lyrische Flügelhorn, sondern zeigte sich auch auf der "normalen" Trompete als Meister. In 1956, trumpeter Art Farmer was teamed with tenor saxophonist Hank Mobley and pianist Horace Silver in one of the most vital and important modern jazz groups of the seminal hard bop era. But it was Farmer here who was emerging as a leader, with Mobley tagging along on this excellent date. Not to say that Mobley was a slouch, and indeed far from it as a peer of Sonny Rollins and John Coltrane. Fact is, Mobley led the band with Farmer and Silver, but achieved his greatest acclaim alongside trumpeters Lee Morgan, and eventually Miles Davis. For Farmer, this recording was a coming out party, establishing him not only as a fine player, but a composer who lyricists were attracted to. 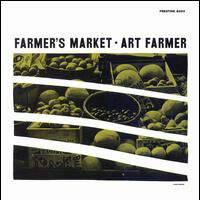 "Farmer's Market" with its by now immortal swift hard bop melody and harmony courtesy of the Farmer/Mobley tandem, and the languid ballad "Reminiscing" with Mobley out but pianist Kenny Drew adding reinforcement a hundredfold, were covered vocally later on by Annie Ross and Earl Coleman respectively. Twin brother Addison Farmer stokes the coals on bass for the hard swinging "Wailin' with Hank," goes for a cool blues groove as the horns play a unison line on "Ad-Dis-Un," and strokes a bluesy swing during "By Myself" as another feature for the trumpeter, in this case with mute, and Mobley sitting out. Drummer Elvin Jones, who sounds like a more sensitive rhythm pilot instead of the powerhouse he would become with John Coltrane, plays his role as an intent listener and firm contributor without pushing the envelope. His style on the recording deserves a close inspection, vis � vis what he would become a decade later. Considering this is early period Farmer, and that his work after leaving the U.S. for Europe led him to playing the softer toned flugelhorn and trumpet exclusively, it is an important document in his legacy, comparing favorably alongside peers Clifford Brown, Miles Davis, and an also emerging Donald Byrd or Lee Morgan. Von 1955-61 nahm der wohl wichtigste Komponist des Jazz für das Label Riverside auf. Und neben neben dem bereits weiter oben aufgeführten Klassiker "Brilliant Corners" gefällt mir aus jener Phase dieses Album hier am besten. Mit Trommler Art Blakey und Saxofonist Coleman Hawkins waren zwei sehr bekannte Musiker dabei, die auch auf dem für Jazzverhältnisse recht witzigen Frontcover namentlich erwähnt werden. Das galt 1957 aber noch nicht für John Coltrane. Aber immerhin lieferte die damalige Aufnahmesession (26.06.57) auch noch 3 Lieder von Coltrane und Monk im Quartett, die, um Outtakes des Septetts ergänzt, im Folgejahr dann unter dem Namen "Thelonius Monk With John Coltrane" erschienen. So weit ich das als Laie beurteilen kann also keine Überschneidungen der Aufnahmen, sondern nur z. T. gleiche Lieder in unterschiedlichen Versionen. "This historic 1957 session, beginning with Monk's favorite hymn ("Abide With Me") and ending with the composer's most affecting ballad ("Crepescule With Nellie"), functions as an overview of his career. As such, MONK'S MUSIC, Thelonious' fifth album for the Riverside label, is a shot across the bow of the hard bop movement. A cubist intro by Monk and Wilbur Ware sets the tone for an extended seven-piece rendition of the pianist's classic "Well, You Needn't," with a fiery underpinning by Art Blakey. Monk is at his angular, bluesy best, opening with Charlie Christian-like percussive accents. He grows more taciturn in the second chorus, unleashing some of his most dynamic rhythmic devices before crying out for "Coltrane, Coltrane." 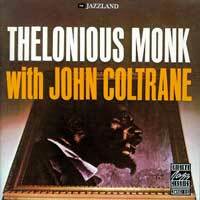 Monk, Ware and Blakey drive Trane relentlessly, and the tenor giant responds with taut, screaming lyricism. Monk responds to Copeland's Gillespie-ish shouts with child-like glee, then recedes as Blakey ghosts Ware's dark, driving punctuations before his own polyrhythmic explosion. Coleman Hawkins enters on the crest of a drum roll with operatic fervor, followed by a feline Gigi Gryce, a coy Monk and a final reprise of the theme. A classic moment in jazz. But MONK'S MUSIC contains numerous highlights. Contrast Hawkins' elegant, barrel-chested machismo on the ballad "Ruby, My Dear" with Trane's rendition a year later on THELONIOUS MONK WITH JOHN COLTRANE. 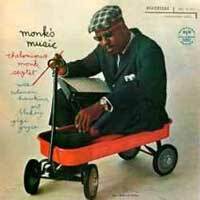 There are two takes of "Off Minor," one of Monk's most swinging lines. Hawkins comes off the starting blocks of the master take like a pit bull, Copeland responds in kind, and Monk follows with dissonant shards of counterpoint and harmonic subversion. Coltrane draws first blood on the spooky "Epistrophy," obviously inspired by Hawkins' steely melodic focus and Monk's probing cross-rhythms; Gryce's solo illustrates his fresh approach to the alto, and Blakey's solo, with its crushing rolls and extraordinary bent tones, is a masterpiece. "Among Thelonious Monk's long stays at New York's legendary Five Spot was a six-month period in 1957 with possibly his most brilliant band, with John Coltrane finding fuel in Monk's music for his harmonic explorations. The quartet only recorded three studio tracks: a sublime reading of Monk's ballad "Ruby, My Dear"; a loping version of "Nutty"; and a stunning version of "Trinkle Tinkle" on which Trane's tenor mirrors Monk's piano part. The CD is completed with outtakes from an octet session that joined Coltrane and Coleman Hawkins and an extended solo version of 'Functional'." Ein echter Hardbob-Klassiker in jeden Fall - vielleicht sogar das "Blue-Note-Album-Schlechthin"? Ich kenne kaum etwas mit mehr Swing als diese Aufnahmen des oft unterschätzten Pianisten, hier zusammen mit dem Trompeter Art Farmer, dem Altsaxofonisten Jackie McLean und dem ein Jahr später durch das Miles Davis-Album "Kind Of Blue" weltbekannt werdenden Rhythmusgruppe mit Schlagzeuger Philly Joe Jones und Bassist Paul Chambers. Recorded in 1958, this legendary date with the still-undersung Sonny Clark in the leader's chair also featured a young Jackie McLean on alto (playing with a smoother tone than he had before or ever did again), trumpeter Art Farmer, and the legendary rhythm section of bassist Paul Chambers and drummer Philly Joe Jones, both from the Miles Davis band. The set begins with one of the preeminent "swinging medium blues" pieces in jazz history: the title track with its leveraged fours and eights shoved smoothly up against the walking bass of Chambers and the backbeat shuffle of Jones. Clark's solo, with its grouped fifths and sevenths, is a wonder of both understatement and groove, while Chambers' arco solo turns the blues in on itself. While there isn't a weak note on this record, there are some other tracks that stand out, most notably Miles' "Sippin' at Bells," with its loping Latin rhythm. When McLean takes his solo against a handful of Clark's shaded minor chords, he sounds as if he may blow it -- he comes out a little quick -- but he recovers nicely and reaches for a handful of Broadway show tunes to counter the minor mood of the piece. He shifts to both Ben Webster and Lester Young before moving through Bird, and finally to McLean himself, riding the margin of the changes to slip just outside enough to add some depth in the middle register. The LP closes with Henderson and Vallée's "Deep Night," the only number in the batch not rooted in the blues. It's a classic hard bop jamming tune and features wonderful solos by Farmer, who plays weird flatted notes all over the horn against the changes, and McLean, who thinks he's playing a kind of snake charmer blues in swing tune. This set deserves its reputation for its soul appeal alone. [The CD version includes two bonus tracks: "Royal Flush" and "Lover"]. Ein eher unbekanntes Album des größten Saxofonisten des Jazz, noch vor seiner Zeit bei Atlantic und Impulse. Wohl sein einziges bei Blue Note. Mit der bewährten Rhythmusgruppe von Miles Davis (Schlagzeuger Philly Joe Jones und Bassist Paul Chambers), Kenny Drew am Piano, Posaunist Curtis Fuller und Trompeter Lee Morgan war das sogar ein Sextett mit drei Bläsern. This album, recorded in September 1957, marked John Coltrane’s comeback after his heroin use led to his ejection from Miles Davis’ band earlier in the year. After going cold turkey and successfully beating his addiction, Coltrane was a man reborn whose music became more sharply focused, especially after he began working with Thelonious Monk. He was still playing with Monk’s quintet when he recorded Blue Train with a sextet that included young trumpet genius Lee Morgan. All but one of the tunes is by the saxophonist, and it’s the title cut, with its memorable clarion call theme, which is the stand-out. Widely acknowledged as Trane’s first masterpiece, anyone looking to buy John Coltrane for the first time needs to start here. Although never formally signed, an oral agreement between John Coltrane and Blue Note Records founder Alfred Lion was indeed honored on Blue Train -- Coltrane's only collection of sides as a principal artist for the venerable label. The disc is packed solid with sonic evidence of Coltrane's innate leadership abilities. He not only addresses the tunes at hand, but also simultaneously reinvents himself as a multifaceted interpreter of both hard bop as well as sensitive balladry -- touching upon all forms in between. The personnel on Blue Train is arguably as impressive as what they're playing. Joining Coltrane (tenor sax) are Lee Morgan (trumpet), Curtis Fuller (trombone), Kenny Drew (piano), Paul Chambers (bass), and Philly Joe Jones (drums). The triple horn arrangements incorporate an additional sonic density that remains a trademark unique to both this band and album. Of particular note is Fuller's even-toned trombone, which bops throughout the title track as well as the frenetic "Moments Notice." Other solos include Paul Chambers' subtly understated riffs on "Blue Train" as well as the high energy and impact from contributions by Lee Morgan and Kenny Drew during "Locomotion." The track likewise features some brief but vital contributions from Philly Joe Jones -- whose efforts throughout the record stand among his personal best. Of the five sides that comprise the original Blue Train, the Jerome Kern/Johnny Mercer ballad "I'm Old Fashioned" is the only cover tune in the stack. In terms of unadulterated sentiment, this version is arguably untouchable. Fuller's rich tones and Drew's tastefully executed solos cleanly wrap around Jones' steadily languid rhythms. This is sheer jazz nirvana. In the spring of 1997, the Ultimate Blue Train CD was released, boasting 20-bit remastered audio as well as one alternate take of both "Blue Train" and "Lazy Bird." Additionally, the disc includes "At Least Listen" -- an interactive CD-ROM program featuring video clips and interview clips with Fuller circa 1995, as well as many brilliant photographs taken during the recording sessions. Without reservation, Blue Train can easily be considered in and among the most important and influential entries not only of John Coltrane's career, but of the entire genre of jazz music as well. Recorded as a one-off while he was still contracted to the Prestige label, Blue Train was John Coltrane’s only solo offering for Alfred Lion and Francis Wolff’s imprint. Recorded in late 1957, after the saxophonist had gone “cold turkey” to quit the heroin addiction that got him fired from Miles Davis’ band earlier in the year, Blue Train marked his rebirth as a drug-free musician. Perhaps because of this, it was Trane’s first truly exceptional long-player and showed him living up to the promise he had shown before drugs threatened to derail his career. Coltrane leads a sextet with a three-horn frontline that includes trumpeter Lee Morgan and trombonist Curtis Fuller, the latter bringing a rich sonority to the album. The opening title tune, with its memorable clarion call horn theme, is one of Coltrane’s classic compositions and offers a vivid example of his ornate “sheets of sound” soloing style in a hard bop setting. The only cover among the album’s five tunes is the Johnny Mercer-Jerome Kern-written ‘I’m Old Fashioned’, a plaintive ballad on which Coltrane favours deep emotional expression over flashy displays of technique. 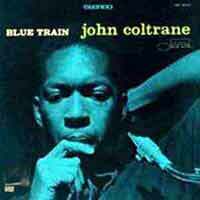 Not only an essential entry in any guide to Blue Note, but one of the first ports of call for anyone interested in John Coltrane, Blue Train is a must-hear album.